Plants annual; tufted, without innovations. Culms 15-45(65) cm, erect or decumbent, sometimes with crateriform glands below the nodes. Sheaths glabrous, occasionally glandular, apices hairy, hairs to 5 mm; ligules 0.4-0.8 mm, ciliate; blades (1)5-20 cm long, (1)3-5(10) mm wide, flat to involute, abaxial surfaces glabrous, sometimes glandular, adaxial surfaces scabridulous, occasionally also hairy. Panicles (3)5-16(20) cm long, 2-8.5 cm wide, oblong to ovate, condensed to open; primary branches 0.4-5 cm, appressed or diverging 20-80° from the rachises; pulvini glabrous or hairy; pedicels 0.2-3 mm, stout, straight, stiff, usually divergent, occasionally appressed. Spikelets 6-20 mm long, 2-4 mm wide, ovate-lanceolate, plumbeous, greenish, with 10-40 florets; disarticulation below the florets, each floret falling as a unit, rachillas persistent. Glumes broadly ovate to lanceolate, membranous, usually glandular; lower glumes 1.2-2 mm, usually 1-veined; upper glumes 1.2-2.6 mm, often 3-veined; lemmas 2-2.8 mm, broadly ovate, membranous, keels with 1-3 crateriform glands, apices obtuse to acute; paleas 1.2-2.1 mm, hyaline, keels scabrous, sometimes also ciliate, cilia to 0.3 mm, apices obtuse to acute; anthers 3, 0.2-0.5 mm, yellow. Caryopses 0.5-0.7 mm, globose to broadly ellipsoid, smooth to faintly striate, not grooved, reddish-brown or translucent. 2n = 20. 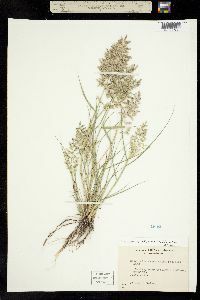 Eragrostis cilianensis is an introduced European species that now grows in disturbed sites such as pastures and roadsides, at 0-2300 m, through most of the contiguous United States and southern Canada. The English name refers to the odor of fresh plants. Annuals, Terrestrial, not aquatic, Stems nodes swollen or brittle, Stems erect or ascending, Stems geniculate, decumbent , or lax, sometimes rooting at nodes, Stems caespitose, tufted, or clustered, Stems terete, round in cross section, or polygonal, Plants viscid, sticky, glandular-hairy, Plants with glandular pits or bands below nodes, on branches or lemma, Plants aromatic or malodorous, Stem internodes solid or spongy, Stem internodes hollow, Stems with inflorescence less than 1 m tall, Stems, culms, or scapes exceeding basal leaves, Leaves mostly basal, below middle of stem, Leaves mostly cauline, Leaves sheathing at base, Leaf sheath mostly open, or loose, Leaf sheath smooth, glabrous, Leaf sheath hairy at summit, throat, or collar, Leaf sheath and blade differentiated, Leaf blades lanceolate, Leaf blades 2-10 mm wide, Leaf blades mostly flat, Leaf blade margins folded, involute, or conduplicate, Leaf blades mostly glabrous, Leaf blades scabrous, roughened, or wrinkled, Ligule present, Ligule a fringe of hairs, Inflorescence terminal, Inflorescence an open panicle, openly paniculate, bra nches spreading, Inflorescence a contracted panicle, narrowly paniculate, branches appressed or ascending, Inflorescence solitary, with 1 spike, fascicle, glomerule, head, or cluster per stem or culm, Inflorescence branches more than 10 to numerous, Flowers bisexual, Spikelets pedicellate, Spikelets laterally compressed, Spikelet less than 3 mm wide, Spikelets with 8-40 florets, Spikelets solitary at rachis nodes, Spikelets all alike and fertille, Spikelets bisexual, Spikelets disarticulating above the glumes, glumes persistent, Spikelets disarticulating beneath or between the florets, Rachilla or pedicel glabrous, Glumes present, empty bracts, Glumes 2 clearly present, Glumes equal or subequal, Glumes distinctly unequal, Glumes shorter than adjacent lemma, Glumes 1 nerved, Lemmas thin, chartaceous, hyaline, cartilaginous, or membranous, Lemma similar in texture to glumes, Lemma 3 nerved, Lemma glabrous, Lemma apex truncate, rounded, or obtuse, Lemma apex dentate, 2-fid, Le mma awnless, Lemma margins thin, lying flat, Lemma straight, Palea present, well developed, Palea membranous, hyaline, Palea shorter than lemma, Palea 2 nerved or 2 keeled, Palea keels winged, scabrous, or ciliate, Stamens 3, Styles 2-fid, deeply 2-branched, Stigmas 2, Fruit - caryopsis, Caryopsis ellipsoid, longitudinally grooved, hilum long-linear. Annual tufted herb 15 cm - 0.85 m tall Leaves: having open, sometimes glandular sheaths with 5 mm long hairs at the tip, and 0.4 - 0.8 mm long ligules with hairs along the margins. The blades are 1 - 20 cm long, 1 - 10 mm wide, flat or with margins rolling toward the upper surface of the midvein (involute), hairless and sometimes glandular beneath, minutely rough and sometimes hairy above. Inflorescence: terminal, branched (panicle), rising above upper leaves, 3 - 20 cm long, 2 - 8.5 cm wide, oblong to egg-shaped, with primary branches 0.4 - 5 cm long. Fruit: a caryopsis, reddish brown to translucent, 0.5 - 0.7 mm long, spherical to broadly elliptic, smooth or lightly lined longitudinally but not grooved. Culm: 15 cm - 0.65 m long, erect to decumbent, often with saucer-shaped glands beneath the nodes. 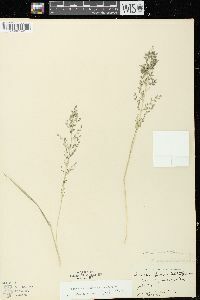 Spikelets: on a straight, stiff, stout stalk 0.2 - 3 mm long and usually not appressed to the branch, lead-colored to greenish, 6 - 20 mm long, 2 - 4 mm wide, narrow egg-shaped, laterally compressed. Glumes: broad egg-shaped to lance-shaped, membranous, often glandular, neither lobed nor awned, with an often single-veined lower glume 1.2 - 2 mm long and a usually three-veined upper glume 1.2 - 2.6 mm long. Florets: ten to 40 per spikelet, with three yellow anthers 0.2 - 0.5 mm long. Lemma: 2 - 2.8 mm long, broad egg-shaped with a blunt to pointed tip, membranous, usually hairless, with longitudinal grooves that each have one to three saucer-shaped glands. Palea: transparent, 1.2 - 2.1 mm long, with a blunt to pointed tip and rough longitudinal ridges that are sometimes lined with hairs to 0.3 mm long. The three anthers are yellow and 0.2 - 0.5 mm long. Similar species: Eragrostis cilianensis is the only Eragrostis species in the Chicago Region that sometimes has hairs along the palea's longitudinal ridge. 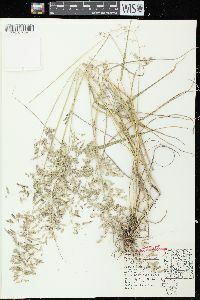 However, the hairs are not always present, and the species may be mistaken for another Eragrostis. Eragrostis frankii is easily distinguished by its far fewer florets (three to six). Eragrostis minor has narrower (1.1 - 2.2 mm) and shorter spikelets (4 - 11 mm), seven to twenty florets, and two reddish brown anthers. 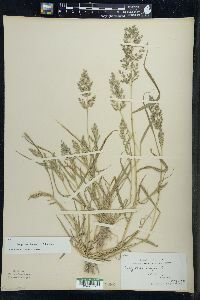 Eragrostis pectinacea is always non-glandular, has shorter (3.5 - 11 mm) and narrower (1.2 - 2.5 mm) spikelets with six to 22 florets each, and three purplish anthers. 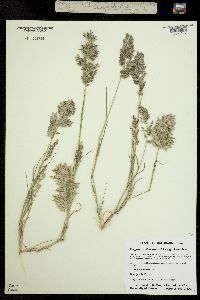 Eragrostis pilosa has shorter (2 - 10 mm) and narrower (0.6 - 1.4 mm) spikelets with three to seventeen florets each, and three purplish anthers. 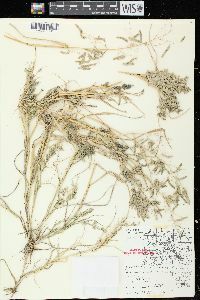 Habitat and ecology: Introduced from Europe, this species is a common late summer weed in waste soils, gardens and fields. Etymology: Eragrostis is derived from the name of the Greek god of love, Eros, and agrostis, meaning grass. 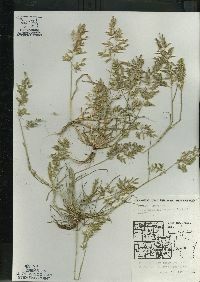 Cilianensis refers to the hairs along the leaf margins. Infrequent to frequent throughout the state. It prefers sandy soil and is frequently a common grass in such soil about dwellings and in gardens and other cultivated grounds. 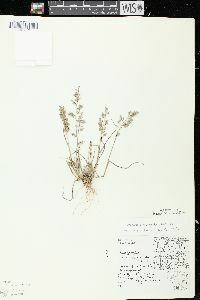 It is generally found in cultivated grounds, in waste places, and along roadsides.